Friday Fun: Bicycle Film Festival is Back! 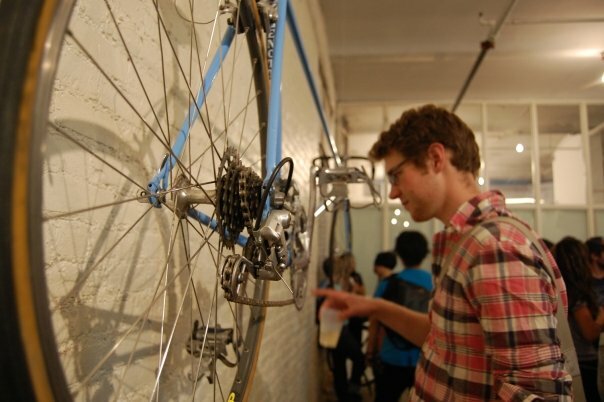 Brook Schaffer enjoys the Bicycle Film Festival in New York City, back in the summer of 2008. Photo by Jonna McKone. Ah, the Bicycle Film Festival is on again! It premieres this week, hitting up Liverpool, Ireland, Portland, Ore. and Chicago, Ill. The founding director, Brendt Barbur, started the festival when he was hit by a bus while bike riding in New York City. He turned his experience into a yearly set of events celebrating biking culture, beginning with the first film fest in 2001. Can Pop Culture Push Sustainable Mobility?